The State of California has awarded $3 million in support to the Metro College Success Program, which helps underrepresented students at San Francisco State University and City College of San Francisco (CCSF) navigate their first two years of college. The funding, announced today, is part of $50 million allocated to state colleges and universities for innovative programs with a track record of boosting student success. The Metro College Success Program helps underrepresented students navigate their first two years of college. Founded in 2007 as a partnership between SF State and CCSF, the Metro program redesigns the first two years of the college experience, serving first-generation, low-income students by grouping them into "academies" of up to 140 peers who take classes together. By creating a supportive academic home, Metro helps students confront the challenges typically faced by college newcomers, such as juggling deadlines, managing an unstructured schedule and keeping up in tough courses. The Metro curriculum focuses on establishing a strong baseline of math, writing and critical-thinking skills and fostering a passion for learning. "We have a lot of capable young people who, with a small additional investment, can successfully graduate from our public education system and go on to do great things for society," said Mary Beth Love, Metro co-director and chair of SF State's Department of Health Education. "At Metro, our mission is to increase equity in higher education and make sure that young people have the skills they need during college and after they graduate." Studies show that nearly 40 percent of underrepresented students in the California State University system drop out before their junior year, and more than 60 percent of underrepresented students drop out of California community colleges before they graduate or transfer. “Metro is working to remedy a major problem with retention," said Vicki Legion, Metro's co-director at CCSF. "Our state's higher education system is clearly not supporting all our young people." The Metro program has proven an effective aid to student success. A 2013 study found that, compared with students who did not participate, Metro students had higher GPAs, graduated faster and were more engaged in academics. They were twice as likely to have a faculty mentor, received more advising and more frequently formed study groups with peers. Sophomore James Espinoza III, a political science major, credits Metro for his success at SF State. Espinoza struggled in high school but is now thriving academically and plans to become a lawyer. "Being the first in my family to go to college, nobody could prepare me for this experience. My parents encourage me, but they can't tell me how to fill out an application, they can't tell me the requirements for a scholarship," Espinoza said. "Metro has shown us that there are people who care about our success. They don't just tell you that you can make it, they help you on that journey." Espinoza expects the academic foundation he gained through Metro to help him throughout his college career and beyond. 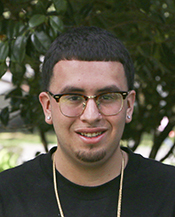 "Metro has made me a better student and given me a sense of purpose," Espinoza said. "It's a two-year program, but the knowledge we've gained, the tools we now have -- that's something we can use for the rest of our lives." The Metro program also lowers costs at its home institutions. A 2013 study found that Metro participation requires an initial investment of $944 per SF State student and $1,484 per CCSF student. But, since most Metro students graduate faster than their peers, state costs per graduate are reduced by an average of $17,879 for an SF State student and $22,714 for a CCSF student. Out of 58 applicants for the state funding, 14 programs were selected to receive "Awards for Innovation in Higher Education." The one-time $50 million allocation supports programs that modify existing practices and systems to help more students graduate and do so within four years. The funding is contingent on the awardees submitting implementation plans for the approval of the award committee. "The Metro program has created a more welcoming and equitable environment for many of our students, paving the way for their academic success," said President Les Wong. 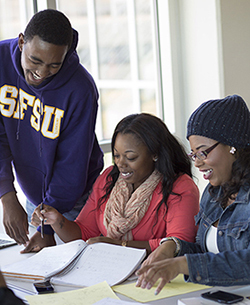 "SF State's Metro program not only helps students graduate faster, it changes their lives. We are thrilled that the State has recognized the importance of this innovative work." Sophomore James Espinoza III credits his success at SF State to his participation in the Metro program. SF State's Metro program was already slated to expand, ramping up from seven to 10 academies to serve approximately 25 percent of freshmen in the next academic year. With this new funding, the program will expand even further, Love said, with the goal of serving a greater number of low-income students by 2018. The CCSF Metro program, which currently has two academies, is expected to grow to six within the same time frame. In addition, the funding will allow Metro leaders to work with local community colleges and other California State University campuses to help implement programs based on the Metro model. Espinoza said he is excited that the new funding will allow the program to broaden its reach, thinking both of the success he has achieved and also of what it means to his parents. "To have a son who is not only going to college but excelling at college makes them really proud," Espinoza said. "This funding means that there will be more opportunities for students to get help, which is great, because all parents should be able to feel that pride."